This post is sponsored by Avery®. Although I am receiving compensation for this post, all comments and reviews of products received are mine and mine alone. I strive to only promote products that I think are excellent. I have a confession – I never fill out my index. Like, never. I just don’t think about it, to be perfectly honest! And flipping around in my bullet journal isn’t exactly the most efficient system. There is a solution, though. For folks like me who don’t really jive with the indexing system, Avery® Ultra Tabs™ repositionable tabs are a perfect solution! 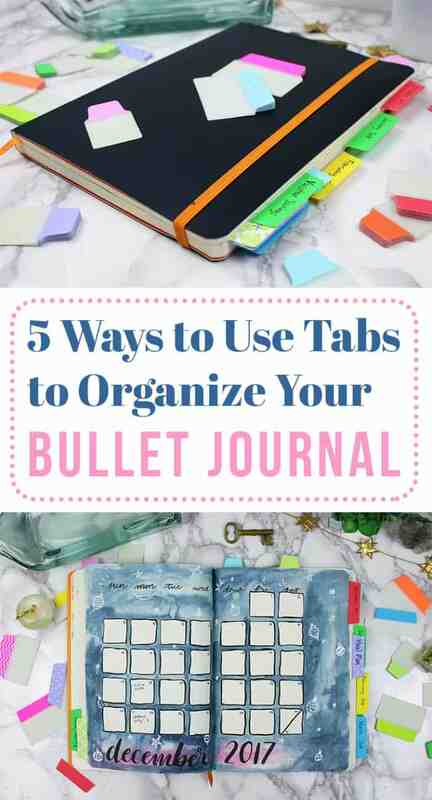 Let me run you through five of my favorite ways to use tabs to organize your bullet journal. There is a ton of important stuff that goes into each monthly spread. You’ve got your calendar and all your scheduling notes for the month, trackers, logs, and lists. Monthly spreads are a hive of activity! So it only makes perfect sense to slap a tab on the margin so you can flip to the important stuff in a jiffy. It makes it so much more convenient for filling in all your trackers and logs every night, and the tab can act as a visual reminder too! This is especially handy if you’re trying to build the habit of doing your trackers every day. Did I mention that the Ultra Tabs are repositionable? Yep! It’s kinda crazy, actually. I had my doubts when I first heard that you could move these tabs around, but let me tell you – they are amazing! You can move them again and again, and they won’t lose their stick or tear up the page when you peel them up. I don’t know what kind of wizardry they’re pulling over at Avery, but color me impressed. Since the Ultra Tabs are repositionable, you can move a single tab forward to each new monthly spread. Of course, you could always just tab all the monthlies in your bullet journal. It’s totally up to you! 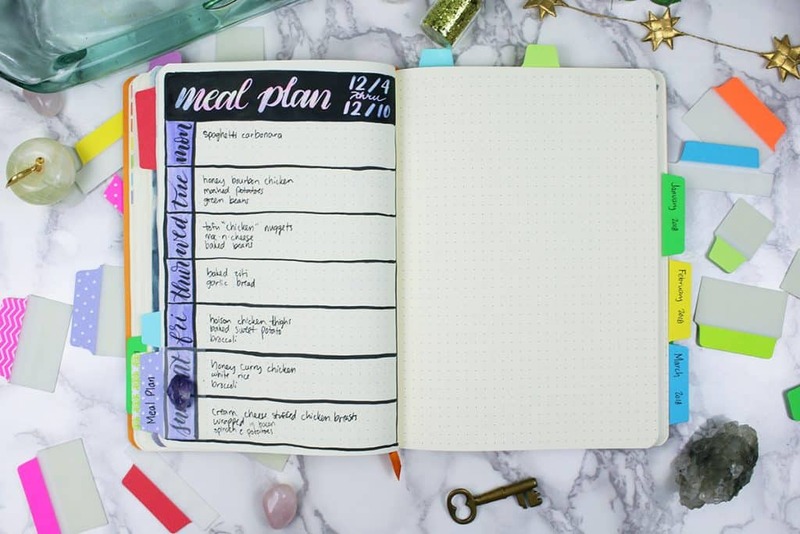 I have struggled to successfully implement a meal planner into my bullet journal for years. I struggle to remember them and reference them throughout the week. One way to put an end to this struggle is to tab my meal planning spreads. Sticking a tab on my meal plan ensures that I know where it is so I can easily crack it open and check what I need to make for dinner each night. I know it seems silly, but a single little tab helps a ton. It helps my peace of mind knowing that I can refer to my meal plan and stop worrying so much about dinner. And it’s also super nice that the Ultra Tabs are smudge free, so even if I’m flipping open my bullet journal while I’m putzing around the kitchen, I’m not going to ruin my tab in a smeary mess. I’ve had that happen with lesser tabs, and it’s a pretty rotten feeling. I’ve said again and again that my Master Grocery List is one of the most convenient and valuable spreads in my bullet journal. As someone who hates grocery shopping, I’m always looking for new ways to make the process more efficient. 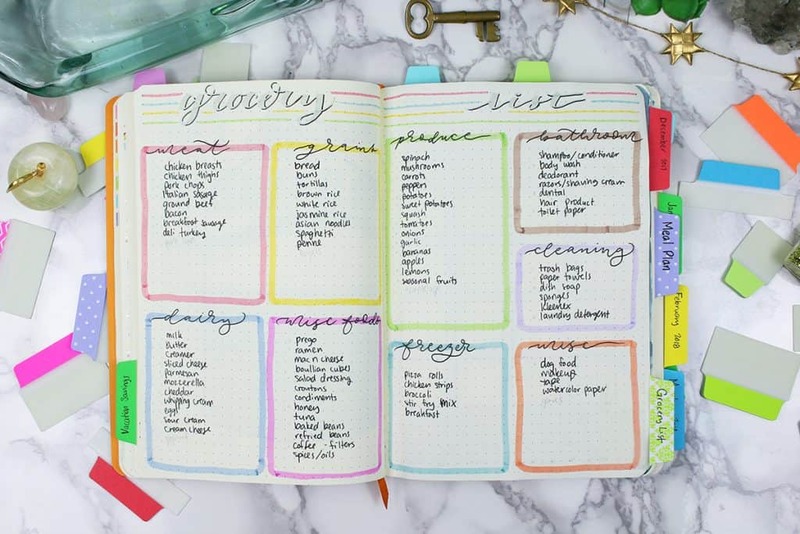 It makes perfect sense to tab my Master Grocery List so I can easily flip to this spread and get my grocery shopping done faster. One thing that always makes me nervous about tabs is that they will inevitably get dog-eared and beat up the second you throw your bullet journal in your bag for errands. That is not so with the Ultra Tabs. These tabs are super tough and are able to take a beating while still looking gorgeous. 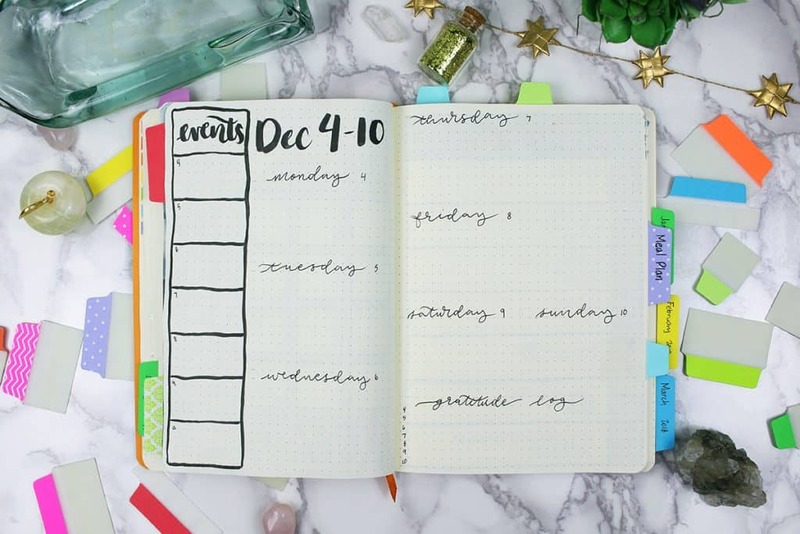 So you can rest assured that when you cart your bullet journal to the store (or school, or work, or whatever), your tabs will stay secure and not fail on you. If we’re talking about efficiency, then of course you gotta tab your weekly or daily spreads. That’s where all your to-dos are, your checklists, your notes. Having that vital pages tabbed is just the most obvious thing in the world. And it works so well! You can grab one of the gorgeous designs or colors and stick it on your current page. Then just move it along through your bullet journal, repositioning it as you go. It can’t get any easier than that. I love creating savings trackers as much as the next person, but I forget about them so easily. I’ll happily fill in my tracker for a month or so, but before long, I’ve moved on with my life and the tracker lies forgotten. That’s where a handy dandy Ultra Tabs comes in. 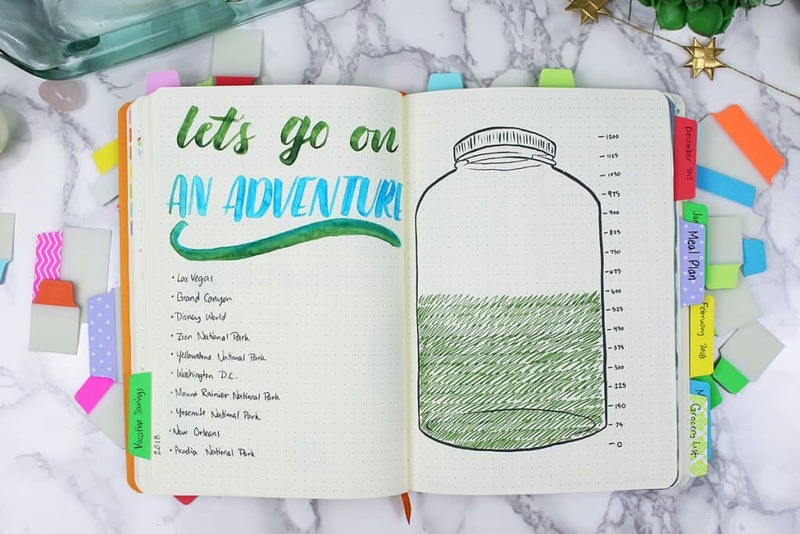 Pop a tab on your tracker and it remains a prominent page in your bullet journal. It’s hard to forget about that old tracker when you have to look at the tab every time you open your bullet journal. With a visual reminder there, it’s much easier to flip back to an old savings tracker to continue to see your growth. 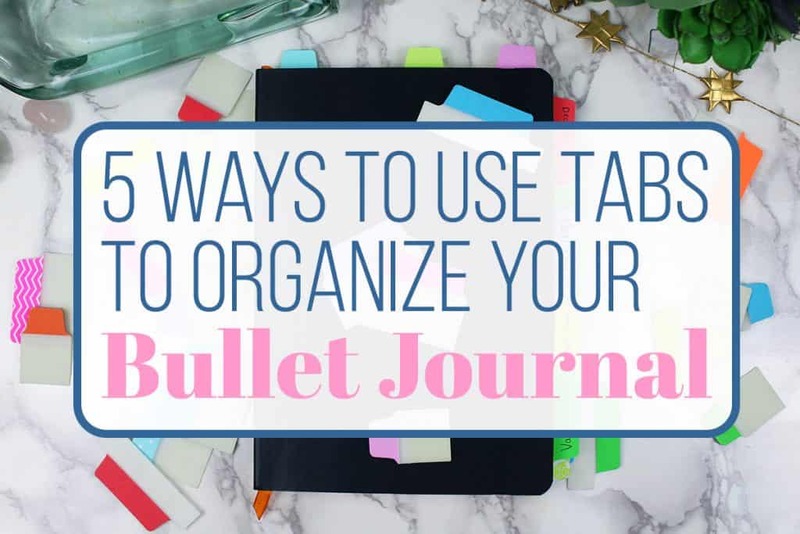 It’s easy to see that a few Ultra Tabs can significantly up your bullet journal organization. Now I feel so much better about not using my index as much because I’m able to keep my important spreads and trackers only a flip away. And with a huge range of styles, sizes, and designs, these tabs can make your bullet journal more functional and look good doing it. If you want to explore the tab options available and grab some for yourself, just head to Avery.com/UltraTabs! I used to be skeptical of using tabs at all, but now I am so excited by the possibilities. How would you use your Ultra Tabs? This is my first time bullet journaling so I hope that this works for me!! Also thanks for recommending the tabs I hope they work for me! 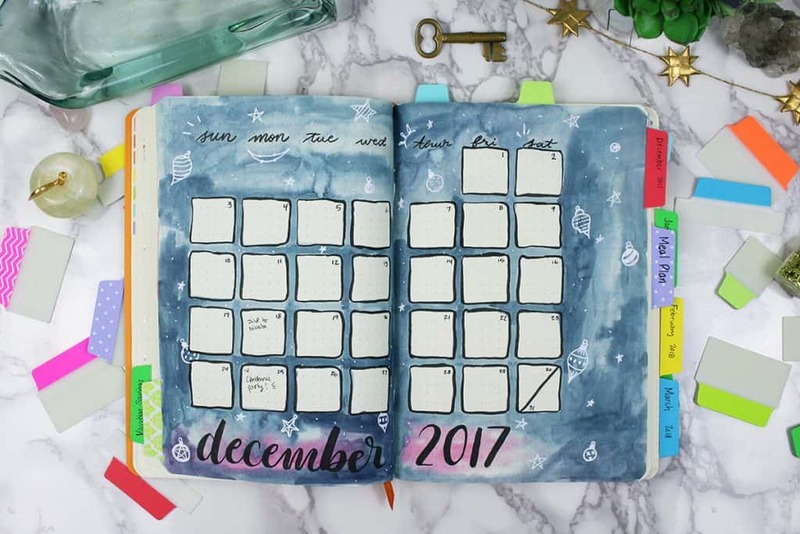 One of the wonderful things about bullet journaling is you can make it your own! You will find what works and doesn’t as you just continue to use your journal, Sydney ? For all of us Bible art journaling folks, these seem like a great alternative to the tabs that are glued in. I’ve been following your website for a while now after finding you on Pintrest. Love your art and your bullet journal ideas. You have great talent and a fun spirit. Keep up the inspiring work! That’s very kind of you, Sara! I agree that tabs are much easier to use than an index. It seems that I can find my page faster with tabs. Avery has been around forever! I find them to be a trusted brand. And, are those tabs you have there not the cutiest? Right?! I love them too Kimberly! Totally agree with you, these are great tabs! If there’s a color in a set I don’t like, I’ll cover them with washi tape. That’s a great idea Valerie! I’ve been using these tabs for my Close to My Heart catalogs. Being a consultant, I often need to quickly flip to different products, paper themes, tools, etc. Even on catalog pages, these tabs move. Also talk about taking a beating and still staying beautiful, these are it! I’ve thrown my catalogs in totes, pouches, watched them take a dive off the table… and the catalog might be dinged but not the tabs. So I heartily cocur with your promotion of them. I didn’t know tho about the cool prints available. Will have to check those out. Love your site, posts, and artistic aesthetic, Shelby! Thank you Barbara! I’d love to hear what you think of them once you give them a try.